Maxwell is located on the livelier south coast of Barbados. It has an excellent climate and beautiful beaches with a wide range of watersports. 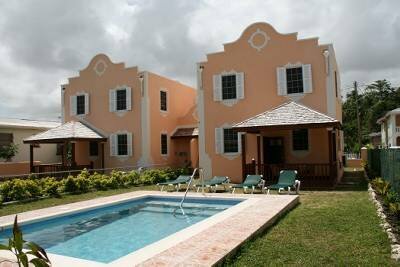 The property is situated 2 blocks back from Maxwell Road which runs from Oistins though to bridgetown. Public transport is excellent and there are regular buses which are clean, well maintained and Inexpensive. Alternatively the locals favour the minibuses that run along the route all day long. If you stand still at the side of the road one will pull up alongside you within a few minutes and ask if you want to get in. The cost is about $2 bds (50p) however far you go. Newly constructed June 2007. 3 bed/3 bath Townhouse with private pool in quiet residential area. Situated in a quiet residential area just 5 mins walk from Maxwell beach. Nearest bar 2 mins walk, other bars and shops close by. Lively St Lawrence Gap with restaurants and nightlife just 20 mins stroll (5 mins taxi). Fishing town of Oistins with the famous Friday night fish fry party night just 15min stroll. Shops, bars, restaurants, pharmacy and medical facilities all within walking distance. A car is not necessary to enjoy this property or surrounding area.